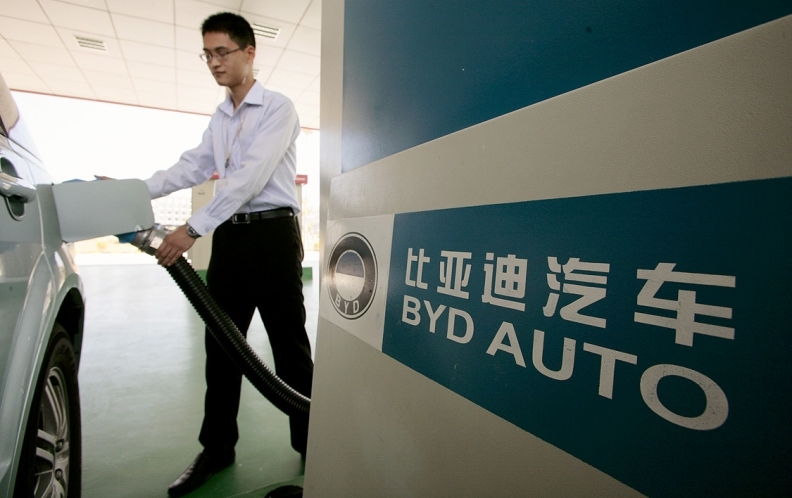 A man charges a BYD electric vehicle at the Chinese automaker's campus in Shenzhen, China in November 2009. China is drafting a plan to become a leader in hybrid and electric cars. Foreign automakers may have to share innovative electric-vehicle technology with Chinese companies in exchange for access to the nation's growing light-vehicle market. Foreign automakers may have to share innovative electric-vehicle technology with Chinese companies in exchange for access to the nation's growing light-vehicle market, The Wall Street Journal reported, citing executives at a group of international automakers familiar with the government's plans. China's Ministry of Industry is drafting a 10-year plan aimed at making the nation a leader in hybrid and electric-car technology. The ministry's proposal could require foreign automakers to enter into joint ventures in which Chinese companies hold majority stakes, the newspaper said. Major foreign automakers fear China will use the initiative to gain control of their intellectual property. China is now the world's largest vehicle market and a major source of sales and profits for many foreign automakers. Under China industrial policy, foreign automakers typically have to establish joint ventures with Chinese automakers to gain access to the market. At the same time, the country has yet to produce a domestic automaker that can compete globally on the same scale as Toyota Motor Corp., Volkswagen AG and General Motors Co.
Chinese government officials see the electric and hybrid initiative as an opportunity to create such an automaker, The Journal said. A draft of the Ministry of Industry's electric-vehicle plan includes an investment of up to 100 billion yuan, or $15 billion, in charging stations and other infrastructure. It also would create three to five globally competitive Chinese car companies with a capacity to build 3 million hybrid cars by 2020, according to The Journal. China hopes the initiative also will produce two to three global makers of core parts, such as advanced batteries and electric motors. One foreign auto executive quoted by The Journal said the Ministry of Industry's draft "unnecessarily raises the hurdle for our plans for producing an electric car in China." Because China is likely to be a major market for electric cars and plug-in hybrids by 2020, foreign automakers will need to build such vehicles in China, the unidentified executive told the paper. “The new pending policy would make the process unnecessarily more cumbersome and complicated," he said. For automakers and other industries, China's importance has grown in the wake of the global financial crisis. But at the same time, Chinese leaders have sought to trade market access for technology to transform the country's industrial base. In July, the U.S. Chamber of Commerce warned that China's policies are "forcing foreign technology companies to anguish over balancing today's profits with tomorrow's survival." The Beijing government, according to The Journal, says concerns about the country's investment environment are unfounded. "China is committed to creating an open and fair environment for foreign-invested enterprises," Chinese Premier Wen Jiabao told global business leaders at a meeting of the World Economic Forum in China this week. "Foreign-invested enterprises in China on the whole enjoy a good environment and have reaped good returns."